First of all, a solar panel doesn't "run" anything, it only recharges your battery(s). You need to start by figuring up what you USE. Number 1 is to minimize your power usage: we carry NO 120VAC appliances such as a coffee pot or microwave. A drip-style coffee maker that uses water boiled on the gas stove makes "real" coffee just fine, and my wife knows how to cook with the oven that's built in to our trailer. A few of the lights have been replaced with flourescents to minimize consumption. Number 2 is to have a good battery that's fully charged. If your Scamp has a converter, I can guarantee that it is NOT suitable for anything except rudimentary battery charging. It won't get your battery fully charged, yet will cook the water from it if you leave it plugged in to shore power at home. If you're to depend on charging the battery with the converter, replace it with an Inteli-Power & Charge Wizard. Besides working very well, it's compact and lightweight, under 5#. A fully charged battery will take care of your needs for at least a couple of days if you're a bit frugal. 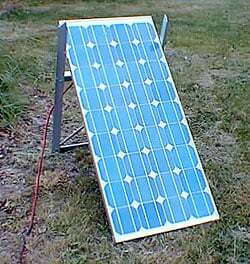 Number 3 is to get an adaquet-sized solar panel(s), those little battery maintainers won't do the job. You need at least a 50 or 75 watt panel, and a couple might be better. Fortunately, you needn't buy them all at once, you can get one now and another later if you find it inadaquet. 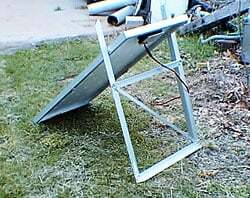 This was the setup we used with a single 75-watt panel and el-cheapo controller, both bought at the Dayton HamVention in Spring 1999. It worked well, and a similar setup should do the job for you. If you want to really KNOW what's going on in your 12VDC system, a good monitor is important. 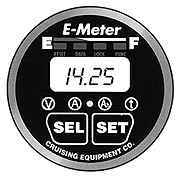 We have an "eMeter" by Cruising Equipment, as shown on the control panel pic. It tracks Amp-Hour usage out of the battery and AH input from the solar panels, so is a true "fuel guage". There are other similar devices that will do the same job, figure a bit under $250.00 for any of 'em. We use a 300-watt TrippLite inverter to run our laptop, charge the cell phone, etc. Our TV is an old Radio Shack 12VDC model with a 5" color screen that draws only 1 amp from the battery. Several of the light fixtures that have 2 bulbs have had the "low" bulb changed out for one that draws only 1/2 amp instead of the 1.5 amp standard one. Forget running power-hungry appliances such as microwave, coffee pot, or A/C. Only the largest motorhomes or 5th-wheel trailers can support such stuff and even THEY can't run an A/C from their solar systems. Don't forget "phantom loads". These are things like the TV antenna booster (about .1 amp), the fridge's auto-switcher if it has one, and your radio (to hold the presets in memory). Some of these are 24-hour loads, so even .1 amp amounts to 2.4 AH/day. You don't need 6, 100-watt panels, 1500-watt inverters, and a bank of golf cart batteries to be independant, you only need to adjust your usage to match your 12VDC system. One often-used rule of thumb is 1, 50 or 75-watt panel and 1 Group 27 battery per person. 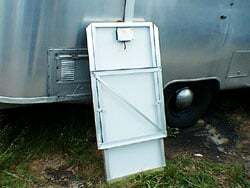 We found that a single 75-watt panel and one battery provided plenty of power for our old AirStream just fine. The Avion is larger (more lights, etc.) and had plenty of room on the roof, so we installed a pair of 75-watt panels. The battery box will only hold the pair of Group 24 batteries, so that's what we're using; it turns out to be plenty of storage, even accounting for cloudy days. Note that we don't get near the 4 amps/panel output with them mounted on the roof, the most I've seen in this configuration is 6 amps total because of the less-than-optimum orientation. However, it works well. If you want to do it right, you really should go through the very simple calculations. Note that we're starting at the USAGE end first, not the INPUT. Everyone asks, "How many solar panels do I need? ", but that's the last question to be answered, not the first. Find out what each appliance and light draws in Amps. 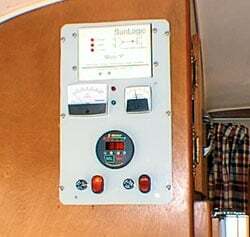 The easiest way is to connect your Digital VoltMeter in series with the battery, set on the 10-amp scale. (be sure that everything is 'off' at the time you connect it) Turn on lights one at a time and record their usage; if the fixtures are identical, their usage will be also. Check your water pump's draw. If your fridge uses 12VDC for the controls, record that. A small inverter to run your laptop will draw about 3-5 amps. Add it up and you get 22 AH/day. The first and most obvious thing is that the Light 1 should be changed to a flourescent that would use only 6 AH/day, lowering our total to 16 AH/day. Now for the storage part: one Group 27 battery is rated at 105 AH. They're actually good for about 80 AH in the real world, and we don't want to draw it down more than 50% if we want it to last more than one season. That's still 40 AH of usable power, so we should easily be able to operate 2 days; we're in good shape there. That battery needs to be recharged, so what do we need in the line of panels? A solar panel will give you its maximum output for only 4 hours/day, and about half that for another 4 hours. A 75-watt panel will provide about 4 amps max, a 50-watt one about 3 amps. That means about 24 AH/day and 18 AH/day, respectively. From our above calculations, we see that the larger panel will do the job nicely, the smaller one should get us by most of the time. If your off-grid stays are short, say 4 or 5 days at a time, the smaller panel will do the job, but if you want to be able to camp w/o power indefinitely, you should consider the larger one. Interestingly, I went through these calculations for our rig and arrived at 20-24 AH/day of usage and concluded that 2, 75-watt panels mounted on the roof should easily provide 36 AH/day. After getting it all rigged up, with the eMeter to monitor things, I found that the calculations were right on! Although I get a bit nervous when we have a cloudy day or 2, the most deficit I've seen has been about 45 AH on the eMeter; we've never come close to running out of juice. 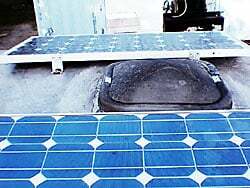 As to sources, I can highly recommend RV Solar Electric. You might want to visit their site and order their Solar Electric design manual and catalog. The manual sells for something like $5.00, IIRC and is very good, especially for a layman. Cost will run about $500.00 for a single 75-watt panel and a controller. You'll want to wire the entire thing with #10 wire to minimize voltage drop and use appropiate connectors if you use the portable panel configuration as I did. 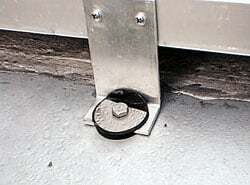 If you add the eMeter or equivilant, add $200.00-$250.00. Add another $400.00 or so for a second panel if you need it; that can be done later, as long as your controller is large enough. It all adds up to about the same as a small Honda genset, but it's *silent*, not merely "quiet", requires no fuel or maintenance, and will last longer than you're likely to live. You will no doubt become a Generator Nazi like I have, looking down your nose at (and hating) those folks who lug their noisy, stinky, hardware store gensets along just so they can make coffee in the morning, then run them half the night so they can watch TV. If you want more information, just ask!